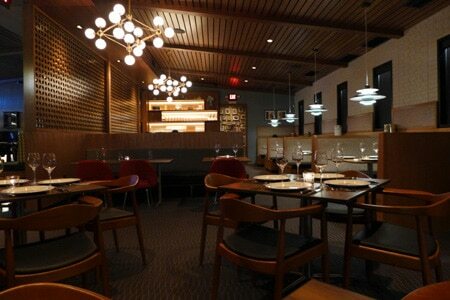 A mid-century modern steakhouse from chef David LeFevre and the Simms Restaurant Group in downtown Manhattan Beach. : Chef David LeFevre and the Simms Restaurant Group (Simmzy's, Tin Roof Bistro) teamed up to celebrate the family's grandfather, Arthur J. Simms. 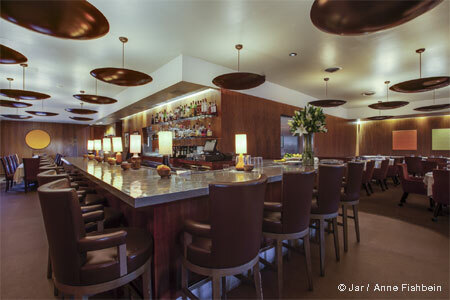 The concept is a mid-century modern steakhouse on Manhattan Beach's posh Manhattan Avenue. This is their third collaboration, following M.B. Post and Fishing With Dynamite. The warm-toned establishment is divided into two sections: the bar lounge with some high-top tables and the dining room with a choice of tables or semi-circular booths. The team members know what they are doing and everything is serious, including the prices. Classic cocktails are given a contemporary spin. Draft beers come from as far away as Belgium, or Torrance for the HopSaint "Pure Intention" pale ale. An interestingly curated wine list sorted by categories anchored by famous actresses of the day (Grace Kelly is bubbles) is complemented by serious selections from Arthur's cellar; think E. Guigal La Mouline, and 30 wines by the glass. The Arthur J menu is structured along the same lines of a typical steakhouse plan. How about some Emmental popovers with butter and strawberry preserves, mushroom soup, or a roasted bone marrow toast to start? Next, you'll need to pick your cut from the USDA Prime beef, Certified Angus beef or Japanese Wagyu options with an array of sauces, butters and toppings. Then add sides, perhaps roasted carrots, mac ‘n’ cheese or mashed potatoes. A bone-in tomahawk for two fetches $148. Variations on beef will take you to an Arthur J pot roast or further away with a roasted chicken, a rack of lamb, grilled salmon and lobster tails. Finish with light daily made sorbets or cherries jubilee with smoked vanilla ice cream.